TALKING TO ERRIE BALL is like stepping into a time machine. Ball, who recently turned 100, was befriended by Bobby Jones at the 1930 British Open, the year Jones completed the Grand Slam. The Wales native came to America at Jones’s urging and took an assistant job at East Lake Golf Club in Atlanta. 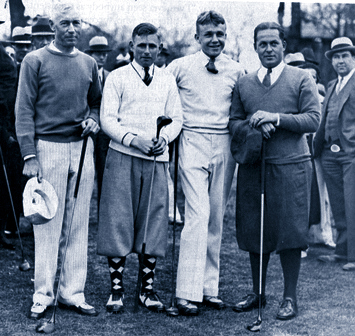 Jones later invited him to play in the first Masters in 1934. Ball is the only surviving player from that inaugural tournament at Augusta National. Errie Ball has seen and/or played with all the greats of the last 80 years, from Harry Vardon to Bobby Jones to Ben Hogan. I talked to Errie three years ago when he was only 97. He is a treasure. Following is an excerpt from our conversation. ARMCHAIR GOLF: What was it like playing in that first Masters? ERRIE BALL: The first Masters, they were having a lot of trouble getting it off to a good start. It was like a friendly deal. I didn’t feel too scared or nervous at all in the first one because it was more relaxed. Bob Jones made it that way. There was a lot of liquor floating around. Of course, in those days, I didn’t drink anyway. But it was more relaxing. When I played it again in 1957 it was a different story. It was really big time. ARMCHAIR GOLF: Bobby Jones was very instrumental in your coming to America and in your golf career. ERRIE BALL: He was. I played in the British Open the year he won at Hoylake in England. Hoylake is my family’s course where they played, and they played Hoylake and my father played there. I played quite a bit at Hoylake. I think I played two British Opens on Hoylake. But the last time was about 1936. ARMCHAIR GOLF: Did you ever meet Harry Vardon? ERRIE BALL: No. I saw him in the distance and watched him. My father was a good friend of Harry Vardon. He had a beautiful swing. I know that. ARMCHAIR GOLF: Some of the more recent golf stories that have been written like The Greatest Game Ever Played are helping people understand what a great champion he was. Most people barely know of Bobby Jones but Vardon was quite something. ERRIE BALL: He was. It’s an entirely different game today compared to those days. They played all kinds of shots. There weren’t any 150-yard markers at all and they had to just play by sight. ARMCHAIR GOLF: Back in those early days, like you said, the pros made their own clubs. I think I read Ted Ray only carried seven or eight sticks on the golf course. So it wasn’t at all like it is now. ERRIE BALL: You could take a five iron and play all kinds of shots with it. Go down the shaft, play the little chip shots, or shots into the wind. You could play several shots with it. It was called a mashie in those days. ARMCHAIR GOLF: I read you were the youngest person to compete in the British Open. In 1926, I read you were either 15 or 16 years old when you played in the British Open. Is that true? ERRIE BALL: I’m not sure about that myself. The press wrote it up that I was the youngest, but I really actually don’t remember that. I know I played in it as a boy. I must have been about 16 or 17, something like that. ARMCHAIR GOLF: Was that in the ’26 Open or 1930? ERRIE BALL: 1930. I played one time in the 20s in the Open, because Hoylake was fairly close to where I lived, where my family lived anyway, so we’d go over there and play. ARMCHAIR GOLF: The first British Open you played in was 1930? ERRIE BALL: That’s the one I remember the most. That’s the one Jones played in on the way to his Grand Slam. ARMCHAIR GOLF: Are you still playing golf? ERRIE BALL: I’ve had a couple of operations, double bypass, which has taken me off the golf course and I haven’t really played 18 holes in two years. But I’ve hit a lot of balls on the practice tee and still give a few lessons. I’m feeling a lot better now but I think I’ll probably start playing soon. The Rules Geek: Bad Behavior Down Under?